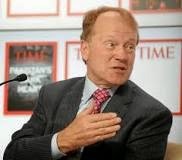 Hot off a good quarterly earnings report, where Cisco grew revenues by 7% and forecast 3 to 5% growth for next quarter (about what analysts were expecting), CEO John Chambers was absolutely ebullient. He declared his competitors all-but-vanquished, particularly upstarts like Facebook and VMware. He said no one needs to worry about Cisco's gross profit margins due to increased competition. He also indicated, again, that he's still no where near ready to retire. Chambers, 65, said he ran four miles that morning, doing it in his fastest time ever, and he lifted weights. An hour before Cisco's earnings, Facebook announced some big progress in its efforts to build a new kind of computer network, using products it developed for itself and is sharing with the world. It urged others to join it in building the same kind of network. Cisco is the dominant player in the network industry, so Facebook's efforts are a rebuff of Cisco's ways. Facebook isn't alone. A number of startups, like Plexxi and Pluribus, are doing a similar things, using off-the-shelf components and open source software. They say their networks are less expensive and easier to manage than the traditional way (i.e., a Cisco network). Cisco calls them "white label," "white box" or "merchant silicon-based switching," networks, which means they use computer processors bought from vendors, mainly Broadcom, instead of the custom-made chips like Cisco creates for its own wares. Many analysts are concerned that these efforts will hurt Cisco, but Chambers pooh-poohed the idea. "We’re seeing no unusual competition, from white label or white box, nor will we in the future," he declared. Customers are opting to buy another round of Cisco's products, instead of these competitors, "simply because of security. In this environment, they aren't going to take risks," he said. "This is where we're just going to crush the white label. There's got to be a security architecture approach. All it takes is one breach and you've done more damage to your brand as a company," he added. That gives you a taste of how Cisco plans to position itself against this new crop of upstarts. Cisco is also a major vendor of computer security products, selling $416 million's worth last quarter. Chambers also said that his company is planning on wiping the floor with VMware, which is not a "white label" competitor, but is selling network software that competes with Cisco's products. VMware, and its parent company EMC, are still some of Cisco's closest partners. They have a joint company together called VCE that sells a lot of Cisco's hardware, particularly its servers. But, as we previously reported, their relationship changed when VMware bought a startup called Nicira in 2012 for $1.2 billion, snatching Nicira out of of Cisco's arms, and launching a new mission to take down Cisco. "VMware is a competitor," Chambers said. "We're going to view them as a competitor and we will beat them and have fun doing it. I wish I was a better person, but I'm not." He also mentioned, a few times, that Cisco now has partnerships with EMC's competitors like NetApp and, more recently, IBM. With competitors dispensed with, so should the ongoing worries that Cisco is going to forced into trimming its profits. The company has gross margins in the 60% range and that's not going to change in the foreseeable future, Chambers said. That's because Cisco is ramping up in new, higher profit areas, like consulting and the Internet of Things, he says. "I've never been more comfortable with any area of our business than our ability to maintain gross margins. It's a mix issue, he says. "I think our gross margins have been the most predictable part of our business." He also declared: "I’ve never felt better about our business and future. We’re back."